I've recommended your book to my friends. They really feel amazing of your work. Almost all of them know first time that there are so many wild lithops that have no Cole number. After reading your book I change my old thought that not only the lithops collected by planters but also the healthy lithops are all very beautiful. These plants have their own evolution to suit environment. The book is beautifully done and the pictures are wonderful! I'm looking forward to reading every word and absorbing every chapter. It is obvious it was a labor of passion. Congratulations for this fantastic book. It looks really interesting for me and sure for all lithops lovers. I am quite impressed. The photos are beautiful, and the writing is clear, informative, and engaging. I also appreciated the extensive references that you provided in the text. Your passion for this work, and for Africa, is very evident. Thank you for sharing part of your adventure with others. Ich bin begeistert über Inhalt und Ausführung. Wo bekommt man heute schon ein Buch, welches noch mit Leinenbindung hergestellt wurde. Die Wiedergabe der Farben, früher oftmals Grund zur Ärgernis, läßt keine Wünsche offen und das von der ersten bis zur letzten Seite. This book describes the immediate habitat in which all of our favourite plants are growing by species. Only by observing their habitat can we get a better understanding of their needs and their communications. This is a must-have for any and enthusiast or horticulturist. 5 stars. Pictures of everything! I enjoy the beautiful book every day! Good habitat pictures and descriptions of the plants involved. I also like the mindset on the relationships between the species and not an alphabetically account of species. ”Wild Lithops” is an impressive combination of science and art. I wish to congratulate the authors for producing this classic piece of work! I have recently acquired a copy of the lovely new Lithops book and must congratulate you on a most spectacular and informative publication! It certainly adds tremendous knowledge to the field of Lithops understanding and your veld photographs are just magnificent. I read randomly a few pages every week. The book is very good mixture of science, history and story telling. I appreciate the effort and time you spent to write it. Congratulations. Do you want to know how to not to kill your lithops? Then Google it. Do you want to taste how they actually live in their natural habitat? Then grab this book. From page to page, this book took me to so many different fields throughout South Africa and made me feel like I'm there with the author and looking at those interesting creatures with them. I have to mention that my favorite part about this book is that many photos made me feel like a kid again who is trying to find the wally on an illustration from the the book, Where is wally? I enjoyed it so much and as an artist and horticulturist myself, I'm sure I will keep going back to this book for many references from time to time. I’m so happy that I got this book not only because it is so informative but also very pleasant to go through each page and get lost. Thank you so much for your hard work and publishing this incredible book! I have read part of it and they are of great value, and I will recommend to my friends. I am very pleased by the quality of the book. The pictures are superb and I envisage using it as an ongoing reference source. The book is highly commended, it is an outstanding piece of work and makes an excellent contribution to our understanding of lithops in habitat. Beautiful photos really help place the plant in its natural context. Thanks for your wonderful sharing on Lithops. The grouping of species is so interesting. The information and illustrations about species are wonderful. It gives me a great reference. Book is fantastic! Very interesting, lots of information, one of the best books. The book is majestic. The time you have allocated to fieldwork and the number of different populations you have studied are both impressive. Congratulations on your work and on producing this wonderful book. Die Fotos sind faszinierend. Ich drücke Ihnen die Daumen, dass Ihr Werk weltweit bekannt wird. Es scheint in einer solchen Form einzigartig zu sein. Review by Katona József, Debrecen. Review by Suzanne Mace & Steven Hammer. The quality of the book is amazing and adds to the library of books on my favorite genus of plants. I am now the proud owner of just about all the published books on Lithops, starting with GC Nel, and this is indeed a generational book, as was the Cole's books and Steven Hammer’s. Bravo for all the work you have done! The book is simply stunning! I can't imagine how much effort was put into creating this Lithops Bible. It not only fully describes each Lithops species, but also gives an insight into their habitats with the use of excellent photographs. A must-have! I received the book and I can not stop going through it. It is an amazing piece of work! The book is fantastic. The quality, content and pictures are just brilliant. Das Buch ist genial, die Heidenarbeit hat sich gelohnt. In this new taxonomic approach most varieties and subspecies are lumped under the species. This is justified by observations in the field that the differences are marginal and the variations even within one locality are too big to separate them from another variety. As far as I have encountered populations I can only agree. Cole did something similar in the Lexicon, but jumped back to the old system in his locality data booklet. The book is full with beautiful habitat pictures and a "must" for all Lithops lovers. I am delighted that I have got this spectacular book and I am impressed with the beautiful photographs and highly sophisticated texts. Gratulation, es ist ein beeindruckendes Buch über Lithops an ihren Standorten. Der Text ist sehr informativ und gleichzeitig unterhaltsam. Die Bilder sind fantastisch, eine sehr gute "Ergänzung" zu den Bildern aus Kultur. 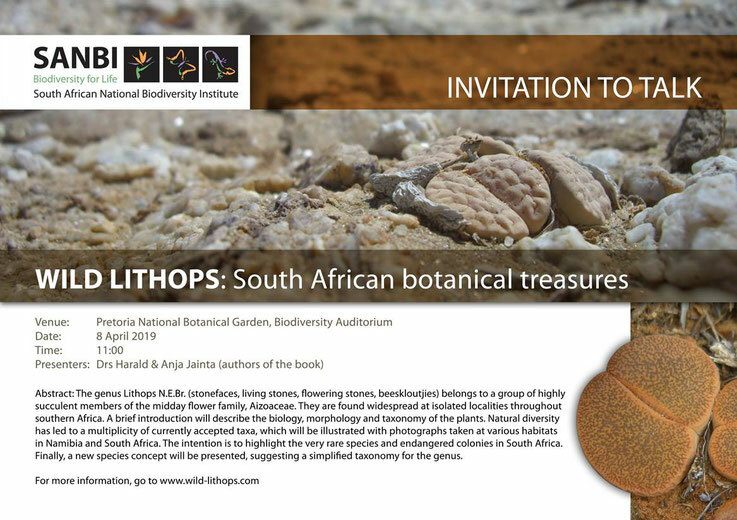 Wild Lithops features all 91 known species in their natural surroundings from a perspective of a field research in Namibia and South Africa. What a monumental job, fantastic pictures and an interesting way to classify Lithops. The book is just gorgeous. It's amazing what a huge amount of work has been done to write such a fundamental book. Beautiful text, great photos, excellent printing. Seit gestern hab ich Euer Buch in meinen Händen, ich möchte es gar nicht wieder hinlegen. Es ist ein grossartiges Buch. The book is inspiring, and wonderful to read. Thanks for all the years of effort that went into taking all of those photos and doing all of the research. Review Article: Niedlich, empfindlich, zäh und einzigartig - Lithops. It is fantastic and a true work of art. Congratulations to you on a superb book. Excellent book with well done text and pictures. Das Buch ist wirklich sehr schön. Unglaublich tolle Bilder, ein absolut tolles Werk. Absolutely fantastic! Lavishly illustrated with photographs capturing the natural beauty of Lithops in habitat and packed with knowledge and information that can only be the result of many years of field research and study. All of this in an aesthetically sumptuous and voluminous publication. Wild Lithops is a must have for every serious student or ardent lover of these gems. Danke für das Buch. Es ist echt super. The book arrived, impressed by the amount of time and effort you put in the book, very happy with it. Seit Jahren hat mich kein neues Pflanzenbuch so begeistert wie Ihres. Es ist in jeder Hinsicht gelungen und damit haben Sie sowohl einen bedeutenden Beitrag zur Sukkulentenforschung geleistet als auch ein optisches Highlight abgeliefert, dass sich sicherlich als Standardwerk etablieren wird! I spent a whole night reading the book! Every lithops collector should have it. Thank you and your wife for your work for this book. It is a high quality production and I certainly like the fact that all images are taken in habitat. Haven´t time yet to look in all details but going to be a really nice winter lecture. Love it! We must give you both the biggest compliments to you and your book! Full of interesting photos with detailed explanations. Must have spent massive amount of time and effort. Lithops in their home are so much different from what I grow. Appreciate the book to be an excellent guide to all lithops lovers. Sie haben ein faszinierendes Werk über die Gattung Lithops geschaffen! Besonders beeindruckt bin ich von der Qualität der exzellenten und so zahlreichen Aufnahmen zu den Standorten und der dort zu findenden Pflanzen. Die zusätzlichen Bildtafeln geben einen sehr guten Eindruck über die Variabilität der einzelnen Arten und Unterarten. It's a marvellous production - beautiful, original, well-made, full of fine detail, with wonderful habit landscape compositions which reveal the romance of lithops more than anything or anyone else ever has, and also their actual feeling (cf. page 172). The text reads very well - in fact I read the whole thing last night. It's amazing how pitiably inadequate your book makes potted/captured/imprisoned/lonely/too-easy-and-juicy lithops seem! Romance is the word - these plants are impossibly beautiful (cf. page 121) and clever. Following the invaluable reference books written by Desmond Cole and Steve Hammer, we now have a magnificent new volume which will appeal to not only the ardent collector but also the average succulentophile. I consider this to be the best book on succulents reviewed in the Cactus Explorer this year and deserves to be very popular. This is not a book about cultivation, nor about lithops cultivars but it comprehensively covers every aspect of the genus in habitat. Dein Buch ist großartig. Ich denke, es wird für lange Zeit die Basisliteratur über Lithops werden. Ich bin sehr beeindruckt. My copy of Wild Lithops arrived today. It looks great, many more photos than I was expecting. Thank you for producing this. Congratulations on your long awaited book on lithops! You can feel good/proud on a 'job well done', after kilos and kilos in RSA and NAM. Tok would have enjoyed to page through it. It is a book that photographs the most beautiful and high image quality wild lithops that I have read. Sie haben den Lithopsnarren dieser Welt ein wunderbares Werk geschenkt. Dieses Buch lässt keine, aber auch wirklich keine Wünsche offen. Herzlichen Dank dafür! I have turned every page of the book and find this to be fascinating and very well done. 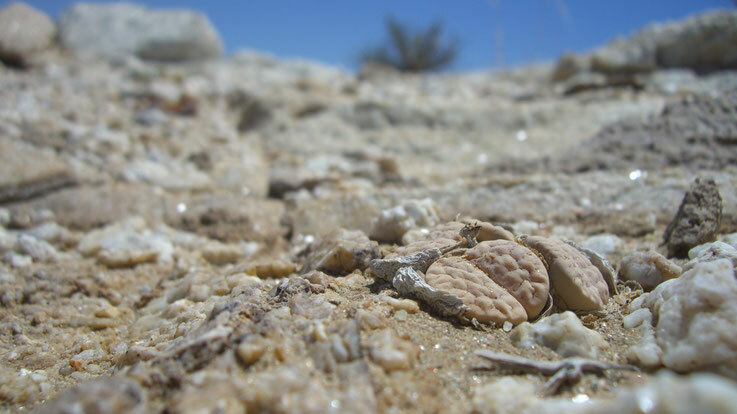 The book brings what it says in the title: excellent photos of Lithops in their habitat. I also enjoyed the historical perspectives and photos. A very fine contribution to the subject, enjoyable and informative. Great book, I'm delighted with it! It is really a remarkable effort and I congratulate both of you. The pictures are clear and the colour very natural. Dieses Buch ist so umfangreich, ich glaube dass es auf Jahrzehnte das Standardwerk über dieses Thema sein wird. Die Bebilderung ist einmalig. Sie versetzt den Leser sofort in die Umgebung. Danke für dieses wirklich fantastische Buch. Einfach tolle Bilder. Cole and Hammer have published their books on Lithops with photos of cultivated plants. Seeing so many plants in habitat was surely not easy and I enjoyed watching your photos. What an enormous amount of work! Thank you in the name of all the Lithoparians around the world! The book is marvelous, brilliantly photographed, a homage to Wild Lithops. I have spent some time today reading and looking at your book and I am spellbound. It is a sumptuous masterpiece, a mammoth task and it reminds me of the things I am missing whilst I earn a living in London. This book is for anyone like myself who truly values this special genus. Das Buch ist jenes geworden, was man den neuen Standard für diese Gattung nennen wird. Es vereint so ziemlich alle Ansprüche an eine Übersicht. Mein Kompliment für dieses umfassende wie exzellente Buch, die drucktechnische Umsetzung ist ebenbürtig. It’s a wonderful book with so many photos. You’ve make a monumental work. Thank you for this book. … it is very impressive and clearly the result of a huge amount of work by you and your wife. I am particularly impressed by the layout, maps and photographs. It looks great! Congratulations, a massive achievement. What a beautiful one! Impressive. Thank you very much. Glückwunsch und tiefe Verneigung, einfach der Hammer! Nach dem ersten Durchblättern bin ich begeistert, sehr, sehr viel Arbeit steckt da drin. Dieses Buch ist jeden Cent wert. Phantastische Fotos. Ihr habt den Lithopsnarren dieser Welt ein Standardwerk in die Hand gegeben. Unglaublich, wie kann man denn so was machen? Glückwunsch.